In Zurich, most citizens hop on their bikes at least two times a week and it is quickly becoming another one of Europe’s cycle cities. Some people, it seems, don’t want to hop off their bikes – not even when enjoying a cup of coffee. So this city, with a great cafe culture and blossoming bike culture decided to combine the two – a bicycle drive-in cafe has bike docking stations so cyclists can pull in, enjoy the morning newspaper and a cup of coffee without leaving their bike. I guess they save money on chairs! 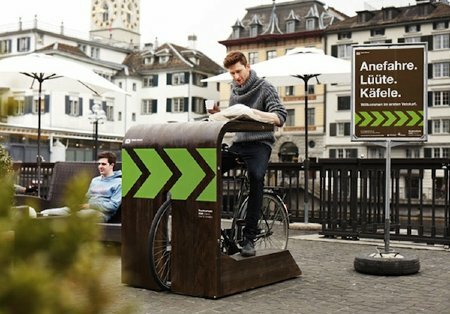 This initiative, supported by the city council, features bicycle docking stations at the Rathaus (city hall). Good idea for Amsterdam, hint hint? We love our bikes & cafes too!